China’s Currency Turbulence: Evidence China Lacks A Committed Economic Direction? Despite the People’s Bank of China’s efforts, China’s currency continues to falter. Last November, in a bid to internationalize its currency, China’s yuan was successfully admitted to the International Monetary Fund’s Special Drawing Rights (SDR) basket of reserve currencies, joining the Euro, the U.S. dollar, Japanese yen and British sterling in the cohort of elite currencies. 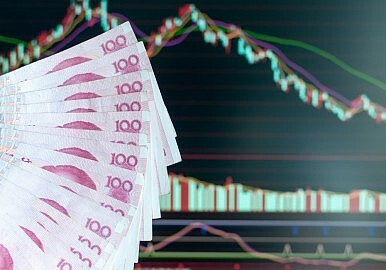 The yuan’s ascension is an economic milestone for China and a political victory for the world’s second largest economy. But success abroad has not translated to gains at home. Wavering between state control and yielding power to market forces, the yuan has begun to yo-yo. China has failed to show commitment to a clear economic direction, revealing to the world Beijing’s political clumsiness and economic policy ineptitude. In an effort towards liberalizing its currency, the People’s Bank of China began tinkering with the yuan last August, further de-linking its value from the U.S. dollar in favor of a broader spread of currencies. The central bank also took more market-centric measures permitting the yuan’s daily rate to be linked to the previous day’s trading value and referring more heavily to foreign-exchange rates. Few then, could have predicted the panic that would ensue as the yuan’s value began to tumble. By January, the yuan had declined by more than six percent, its largest depreciation in two decades. China’s rush to intervene, selling dollars and soaking up superfluous yuan, left international investors reeling as their expectations were disrupted. It also exacerbated the debate over capital controls at home as the depreciation prompted the flight of funds abroad. What message, then, should investors draw from this episode? Many believe that the pattern of ceding then reasserting control in a reactive fashion displays a lack of commitment by China to any given policy direction. For international investors such as Patrick Chovanec, the crisis signals an uncertain road ahead. “I think the problem is there is no clear policy,” said Chovanec, chief strategist at Silvercrest Asset Management. “The ambivalence in their actions reflects the ambivalence of their thoughts,” he added, referring to the lack of conviction displayed by policymakers in a country usually associated with careful planning. But the currency crisis need not be indicative of a wavering internal plan. Some economists lay the blame outside China, contending that the currency turbulence was a global overreaction to China’s slowdown to a new normal. “A lot of speculation is hidden beneath the surface,” said Andrew KP Leung, a consultant and China strategist. As China attempts to move its macroeconomic policy from an export orientated model to a more consumer led model–think made for rather than in China–some economists fear that the inconsistencies displayed in the handling of the currency crisis may be a sign of things to come. The currency depreciation, although buoying exports, has increased the price of imports, causing a slump of almost 19 percent in January, more than double the decline in December, contradicting China’s overarching economic goal. China’s aim to internationalize its currency means that it will have to continue efforts towards liberalizing its markets. But the rules of the global game require transparency and consistency if China is to engender confidence that it is following a committed plan. Adela Suliman writes about politics and economics in China. She is based in New York and tweets @ASBintBattuta. China's Currency Set to Join IMF's Elite Currencies Club. So What? The IMF has said that it will recommend the renminbi's inclusion in its elite SDR basket of currencies. Huawei’s Legal Woes and Tech ’Decoupling’ Between China and the WestWhy Xi Jinping Thought Is a Threat to China's FutureThe Decline and Attempted Revival of China’s Economic ExceptionalismThe Chinese Are Winning?Bush Gave China Permanent Normal Trade Relations Status With the US 15 Years Ago. What Did That Change?